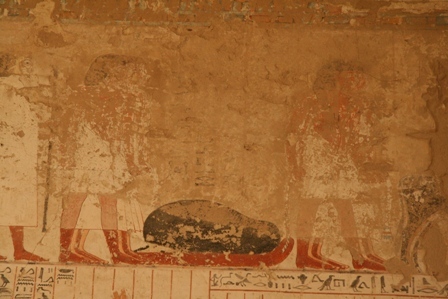 The Hair sm3 and the Healing of the lunar Eye in Ancient Egypt. Part II: The damaged Eye of Horus. 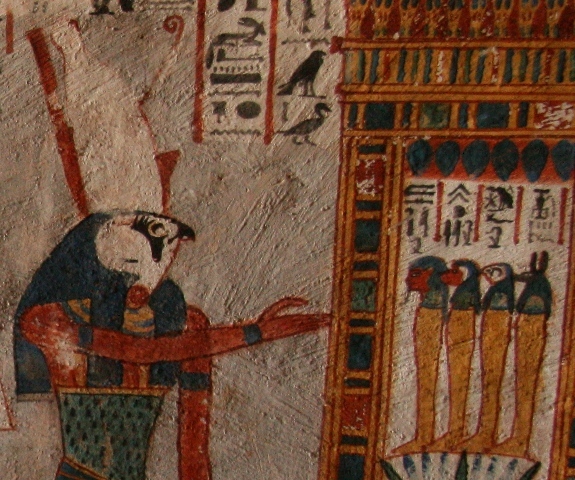 The god Thoth. 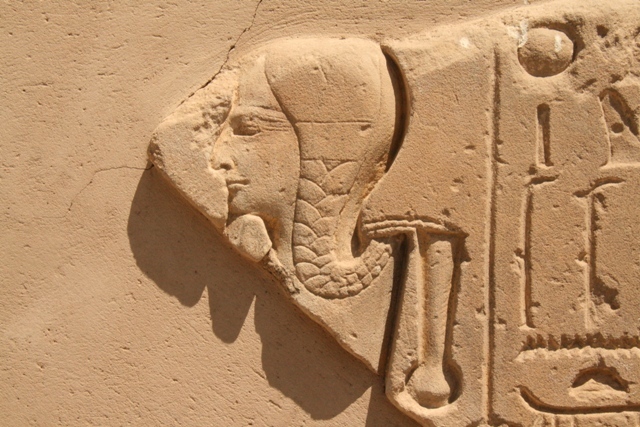 Relief from the ptolemaic temple in Deir el-Medina. Photo: Mª Rosa Valdesogo Martín. “He has come with that one that spits the hair (sm3), for his hair (sm3), which is sick at the beginning of each month and sick at the beginning of middle month”. “…this N. is the one who makes the rite ibd (the second day of the month) and he is the one who controls the rite nt (fifteenth day of the month).The plait of hair of Horus is on the hand of this N. in the Thoth’s entourage…“  (important to remember that chapters 167 and 674 mention mourner’s hair sm3 joint with two lunar festivities: snwt and dnit). 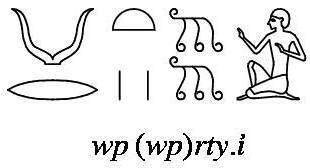 Egyptians considered equal the lunar eye and hair sm3, and we will see that many times. After spitting at the hair sm3, chapter 133 says how the deceased gets up triumphant, it seems that after healing the eye, he could rebirth again. In chapter 164 again the act of spitting at the hair sm3 is a healing action, here the god spits first over the shoulder. 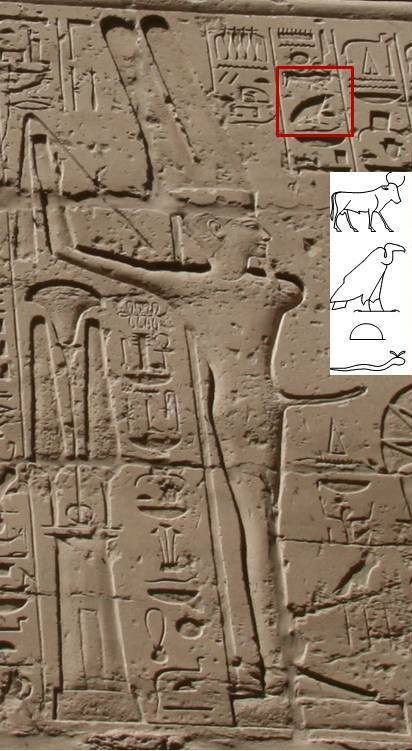 According to P. Barguet the passage relates the healing of the Osiris’ injured shoulder and hair sm3, that is, the lunar eye ; the chapter mention mutilations that have happened in the myth of Osiris and that have been solved after the battle. In chapter 610 the healing is over the hair sm3 of Atum and also over Hdd. 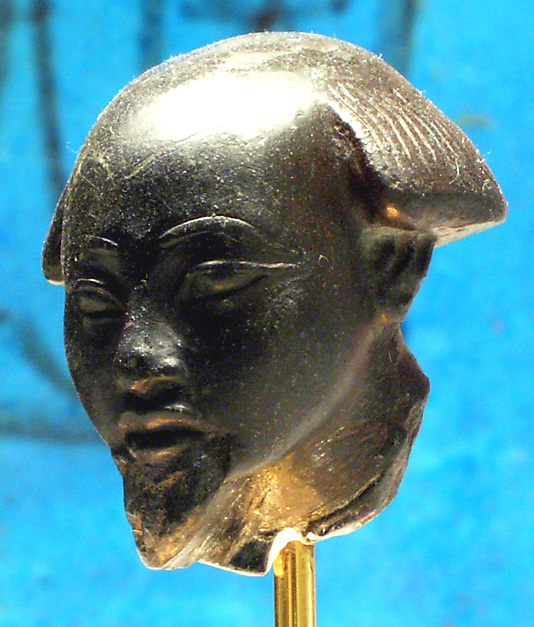 In Egyptian mythology the moon, that is, the Udjat eye, is one of the eyes of Atum, the other one was the sun. Hdd is a name coming from the verb hd, which means “attack”. It is a 2-lit. verb with second radical geminated in perfect passive participle. So, the meaning of hdd could be “attacked”, “the one who has been attacked”. This way, Hdd would be personifications of the attacked eye of Horus, hence the need of refreshing it for its cure. But it is also interesting to notice how in chapter 667 the healing of the hair sm3 is at the same level of offering a leg and giving breath, both gestures for giving life. Finally, we find a very visual moment in all that process of healing the damaged lunar eye. We have translated chapter 335 as the action of raising the hair from the Udjat eye. P. Barguet considered that m was an equivalence preposition, so for him the text was saying that the hair Sny was the same Udjat eye. But if we take preposition m as “from”, the passage makes more sense. It would be describing the gesture of moving the hair away from the lunar eye for healing it, and also from the face for allowing seeing the light after the darkness. 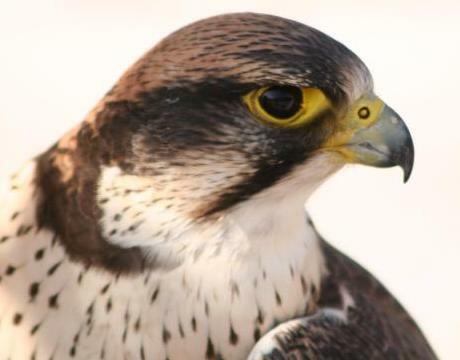 In Ancient Egypt (as many cultures) the eye, as the vision organ, symbolizes the light and its disappearance or mutilation is a synonym of darkness. The sacrifice of the eye and its following recovery supposes a regenerating act, in the same level of creation after the chaos. Restitution of vision means access to light after the darkness of the death. 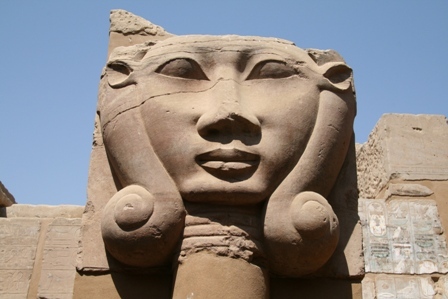 We have already seen in chapter 533 how the face of Hathor gets visible and clear after separating the two lateral ringlets, opening them as if they were curtains the deceased can see the full moon. When moving the hair Sny away from the face allows healing the eye and makes the Udjat eye visible, the healthy eye, that is, the full moon. On the other hand, we know that hair Sny is similar to hair sm3, the same hair that did not allow to see the brightness and could be a symbol of darkness and shadows. 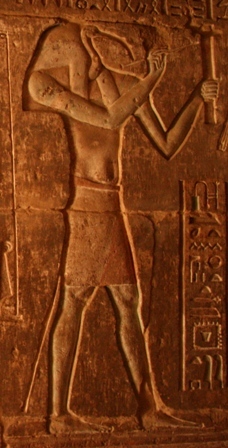 The one who moves the hair away from the eye is Thoth because, according to the Egyptian legend, he is the lunar god who heals the lunar eye after the fight against Seth. 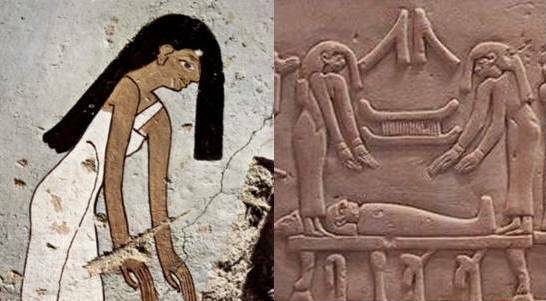 The connection between the hair and the eye of Horus is clear, but if Thoth spits over the hair sm3 for healing the eye, this one cannot be the Udjat eye (the healthy one), but the damaged eye of Horus, which in Egyptian was nknkt or nkkt and who needs a cure for becoming the Udjat eye. Once again we find the hair with a negative nuance; we have seen previously that the hair sm3 was a symbol of the chaos, the primeval waters, it was the Nun that dominated the world before the final creation. H. Kees considered that the hair sm3 in the context that concern us could be the damage suffered by the lunar eye, which makes the darkness of the night; in the same way that the hair sm3 over the faces of the mourners covers their eyes and they cannot see. So, to split over the hair sm3 would eliminate that damage, in the same way that to move the hair away from the face means to see the light. The god Seth. 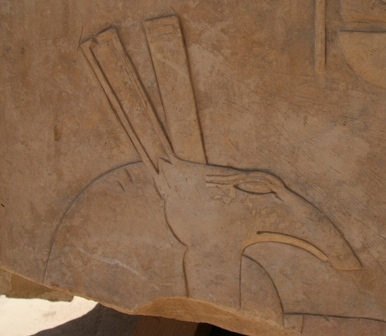 Relief from a block in the Open Air Musuem of Karnak. Photo: Mª Rosa Valdesogo Martín. 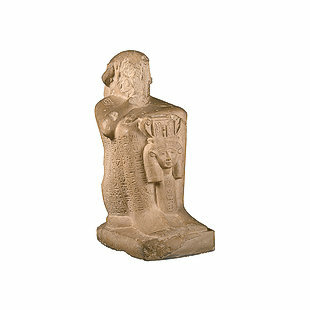 The hair sm3 would then symbolize in Egyptian belief the disorder dominating during the fight between Horus and Seth. This combat is full of sense, since, as says J.E. Cirlot, the fight is the “primeval sacrifice”; it is the combat between two apposite forces, and it contributes to stimulate the vital energy, whose result is the victory of the order over the chaos. This victory means the world creation, and the winner goes out from it as a hero with an extra power. 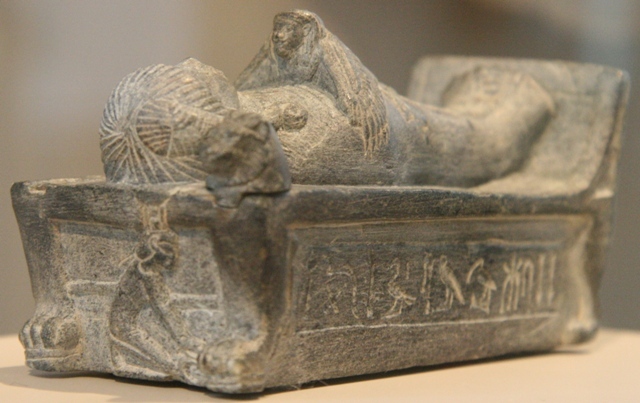 In the Egyptian funerary context that meant the resurrection of the deceased, the access to the light to his new life. The word nqm, parallel to “sick”, in reality designates a “bad property of the hair”(Wb II, 344, 3). S. Ratié, 1984, p. 179.
 iw dnt irt ¡r Hr(y)-a n N pn m smswt DHwty CT IV, 277. P. Barguet, 1986, p. 377, n. 10. According H. Kees, Sni and sm3 have both the same relationship with the lunar legend (H. Kees, 1925, p. 8). H. Kees, 1925, p. 8. J. E. Cirlot, 1991, p. 282.